slmag.net 43 Several weeks prior to my visit, I received a lovely care package from the company that included a thoughtfully compiled guide to Sicily prepared in-house by the affable Max Lane, a British expat who now resides in Sicily full-time. At nearly 200- pages, it was a light and entertaining read interspersed with photographs, that served as an ideal roadmap for planning where and what to visit based on my interests: archaeology, architecture and eating (not necessarily in that order). 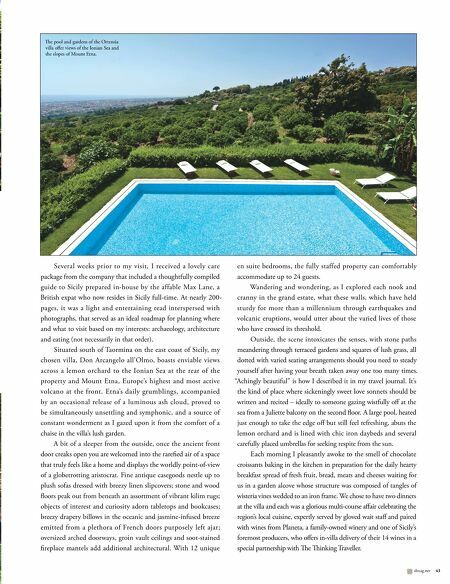 Situated south of Taormina on the east coast of Sicily, my chosen villa, Don Arcangelo all'Olmo, boasts enviable views across a lemon orchard to the Ionian Sea at the rear of the property and Mount Etna, Europe's highest and most active volcano at the front. Etna's daily grumblings, accompanied by an occasional release of a luminous ash cloud, proved to be simultaneously unsettling and symphonic, and a source of constant wonderment as I gazed upon it from the comfort of a chaise in the villa's lush garden. A bit of a sleeper from the outside, once the ancient front door creaks open you are welcomed into the rarefied air of a space that truly feels like a home and displays the worldly point-of-view of a globetrotting aristocrat. Fine antique casegoods nestle up to plush sofas dressed with breezy linen slipcovers; stone and wood floors peak out from beneath an assortment of vibrant kilim rugs; objects of interest and curiosity adorn tabletops and bookcases; breezy drapery billows in the oceanic and jasmine-infused breeze emitted from a plethora of French doors purposely left ajar; oversized arched doorways, groin vault ceilings and soot-stained fireplace mantels add additional architectural. With 12 unique en suite bedrooms, the fully staffed property can comfortably accommodate up to 24 guests. Wandering and wondering, as I explored each nook and cranny in the grand estate, what these walls, which have held sturdy for more than a millennium through earthquakes and volcanic eruptions, would utter about the varied lives of those who have crossed its threshold. Outside, the scene intoxicates the senses, with stone paths meandering through terraced gardens and squares of lush grass, all dotted with varied seating arrangements should you need to steady yourself after having your breath taken away one too many times. "Achingly beautiful" is how I described it in my travel journal. It's the kind of place where sickeningly sweet love sonnets should be written and recited – ideally to someone gazing wistfully off at the sea from a Juliette balcony on the second floor. 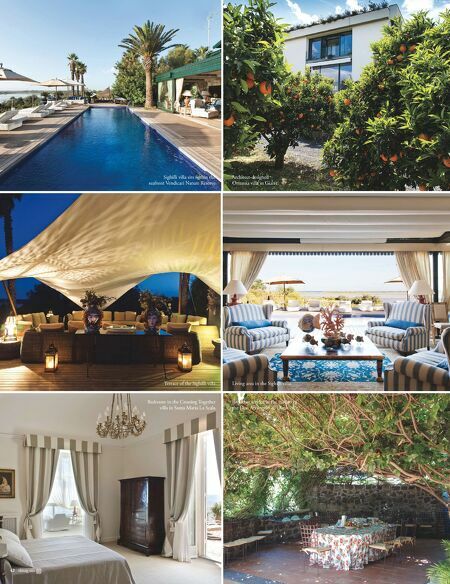 A large pool, heated just enough to take the edge off but still feel refreshing, abuts the lemon orchard and is lined with chic iron daybeds and several carefully placed umbrellas for seeking respite from the sun. Each morning I pleasantly awoke to the smell of chocolate croissants baking in the kitchen in preparation for the daily hearty breakfast spread of fresh fruit, bread, meats and cheeses waiting for us in a garden alcove whose structure was composed of tangles of wisteria vines wedded to an iron frame. We chose to have two dinners at the villa and each was a glorious multi-course affair celebrating the region's local cuisine, expertly served by gloved wait staff and paired with wines from Planeta, a family-owned winery and one of Sicily's foremost producers, who offers in-villa delivery of their 14 wines in a special partnership with e inking Traveller. e pool and gardens of the Ortensia villa offer views of the Ionian Sea and the slopes of Mount Etna.